We manufacture and supply Standard Penetration Test Apparatus that is designed and styled as per the industrial standards by adopting advanced technology. Known for the precise make and excellent features, the Standard Penetration Test Apparatus is greatly demanded by several industries. This Standard Penetration Test Apparatus can be availed from us at the market leading price. 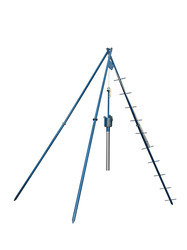 Tripod Stand with 5 metre long legs ( in two pieces ) complete with a tee bolt and pulley block or sheave. Drop Hammer as per IS : 2131 weight 65 kg with lifting eye. Guide pipe assembly with two end caps to give a free fall of 75cm for the drop hammer. Split Spoon Sampler with Brass Liner comprises of split barrel 50.8mm outer dia x 35mm inner dia x 610mm long, driving shoe for sampler made of hardened steel, head assembly having square thread suitable for A type Drill Rod complete with ball type check valve. Type A Drill rod 1 meter long.